A Yorkshire gin start-up that was made in the founder’s parents’ utility room has scooped the top UK spot for the Best London Gin at the World Gin Awards. 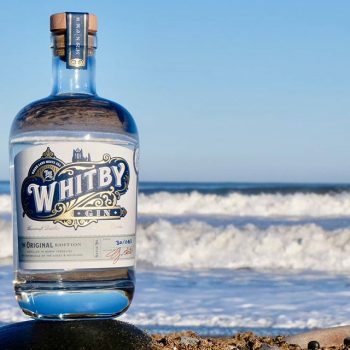 Whitby Gin, which was set up only ten months ago by young couple Luke Pentith and Jessica Slater and originally made in the 40 sq. ft utility room of Pentith’s parents’ house, beat around 50 other UK gin brands to win the Best London Gin country category. It will now battle against the top London gins from across the world including Japan, Australia, India, Denmark and Germany to vie for the world best title, which will be announced next month. “There were over 50 other gins in the frame, including a number of well-known brands, so we are very proud of our achievement,” Pentith said. The gin is inspired by the historic town, seascape and surrounding moorland of Whitby, and in addition to the 12 traditional gin botanicals, uses local botanicals such as distilled Sugar kelp, foraged from Robin Hood’s Bay at low tide, heather from the North York Moors, and Yorkshire honey from a local beekeeper, Slater said. “Authentic craftsmanship is at the heart of what we do,” Pentith adds. Since the brand was launched at the end of March 2018, it has gained listings in more than 200 outlets across the UK, including some of the top retailers in the region, namely English Heritage, Fenwick in York and the Star in the Harbour, Moor & Tide and the Magpie in Whitby. 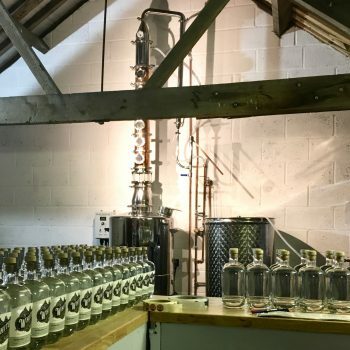 Last year the couple gave up their jobs to concentrate on the fledgling business and now produce around 1,200 bottles a month by hand from a barn in Whitby, having moved out of the utility room last summer – but are hoping to set up their own small distillery in Whitby, which will allow them to scale up production. Pentith told db they was working with Whitby Council who are building new business units in the town, which they hope to move into over the summer. “Our business plans and growth have helped the council justify this new development of business units in the town,” he told db. The new premises will be an interim solution that will enable them to boost production by around 300% and create new products as well as meeting the increased demand of its current range, as well as opening a small shop on-site, with a tasting experience which will enable them to interact with customers direct. However the longer-term plan is for the brand is to develop its own bespoke premises which will enable them to maximise the potential of the brand and the customer experience, and it is already working on a private plan to put this into action. He said the addition of a distillery would complement the growth of the town’s food and drink culture and they are hoping to employ and up-skill local people beyond the hospitality trade which is says is typical of the seaside town. “This project is in its infancy and we will be reviewing funding options in due course,” he told db. In October it produced a special Hallowe’en Stoker Edition Gin, blackberry and ginger variant in homage to Bram Stoker’s connection to the atmospheric town. The World Gin Awards recognise the best gins in a variety of categories from across the world, including classic, contemporary, compound, flavoured, Genever, London dry gin, mature, old tom, navy and signature botanical categories. Other best of UK winners includeThat Boutique-y Gin Company’s Yuzu Gin, Black Powder Gin Flintlock Navy Strength Gin, Firkin Gin Oak Aged and Sacred Old Tom Gin.